This white staircase is lined with strips of LED lights to brighten up the dark space. What a great idea! 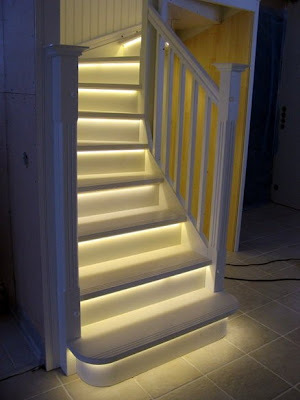 This is a neat way to light up your staircase, while making it glow beautifully. Also, LED lights are a great choice not only for the environment, but also for your wallet. LED bulbs use 80% less energy than incandescent bulbs, which will cut the cost of your electricity bill. Say YES to LED!